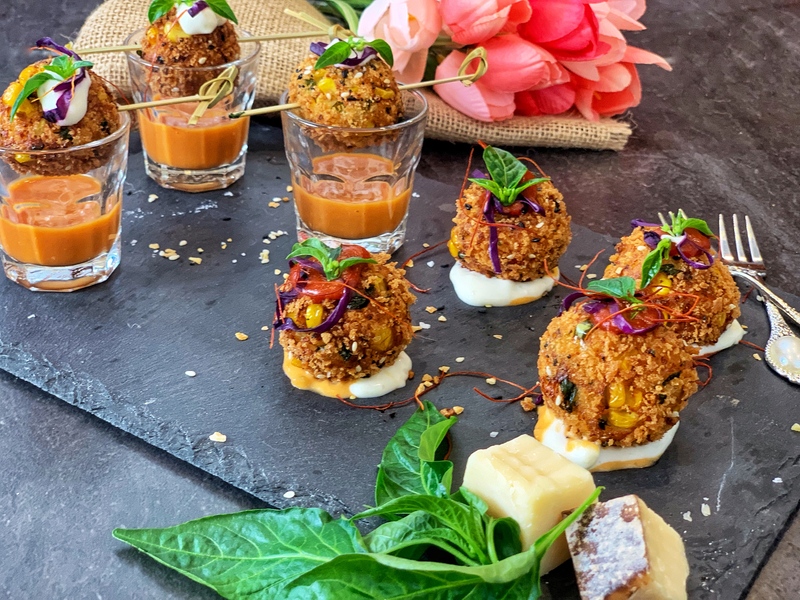 Crunchy, tangy, and super creamy, these Cheese Corn Balls are the the yummiest way to indulge! Stuffed with melty cheese bursting corn, this melody of tastes and textures will create heaven in your mouth. The magic all starts with a beautiful mixture of cheese, corn, paneer, and mixed herbs. Coated in spiced breadcrumbs, this appetizer can’t get any more perfect! It’s crisped to perfection without feeling greasy and is the right blend of sweet and sour and crunchy and creamy! Enjoy it with some bold dipping sauces and share it with friends, family, and guests. It’s sure to put a smile on the face of whoever eats it and brighten their day!! Trim the crust off of the bread and cut it into fourths. Put these pieces into a food processor and process them, making sure they are a very fine mixture. Move the bread into a large bowl and add in the yogurt. Incorporate the yogurt into the bread mixture using the back of the spoon. The yogurt is needed to add sourness, but should not make the bread soggy since more moisture will be added. In the food processor, add corn and just pulse it once. Add it into the large bowl with the bread mixture. Add the paneer, cilantro, cheese, ginger, green chili, salt, pepper, and chili flakes. Mix it well together. Shape the mixture into small round balls about 1.5 inches in diameter. Heat up the oil on the stove in a large saucepan. Mix the garlic powder, breadcrumbs, sesame seeds, and Italian herbs in a small bowl. Roll the cutlets in the breadcrumbs and fry on medium heat until they are golden brown. Serve with srirancha (mix equal parts of ranch and sriracha), ketchup, and hot sauce! Enjoy! Corn cutlets can be made a day or two ahead for a party. Just make sure not to coat them with breadcrumbs. Store them in the fridge in between two kitchen towels to make sure they don’t get too moist. I used everything bagel seasoning for the breadcrumbs. If the cutlet mixtures too wet, add one or two slices of food processed bread into it. Make sure that your corn is relatively dry before adding to the mixture. You can use a kitchen towels to achieve this. I used Italian five cheese blend for the corn balls. Wud surely give a try .